The Maryland Arts Summit partners have committed to equity, diversity, and inclusion in the planning and implementation of the Summit. We are aided by the work of the National Endowment for the Arts, the National Assembly of State Arts Agencies, and Americans for the Arts, as they have clarified and shared approaches to uncover cultural bias in the procedures and policies of state arts organizations. expand deliberations to include criteria beyond current conventions or Western traditions. We recognize that this is an ongoing effort. We are committed to listening to feedback, both throughout the process and after the Maryland Arts Summit has taken place, to inform subsequent programming. For information about regional transportation and hotel accommodations near UMBC click HERE. The Artists Bazaar serves as a networking and promotional opportunity, as well as a free space for Maryland artists of all forms to showcase and potentially sell their work. 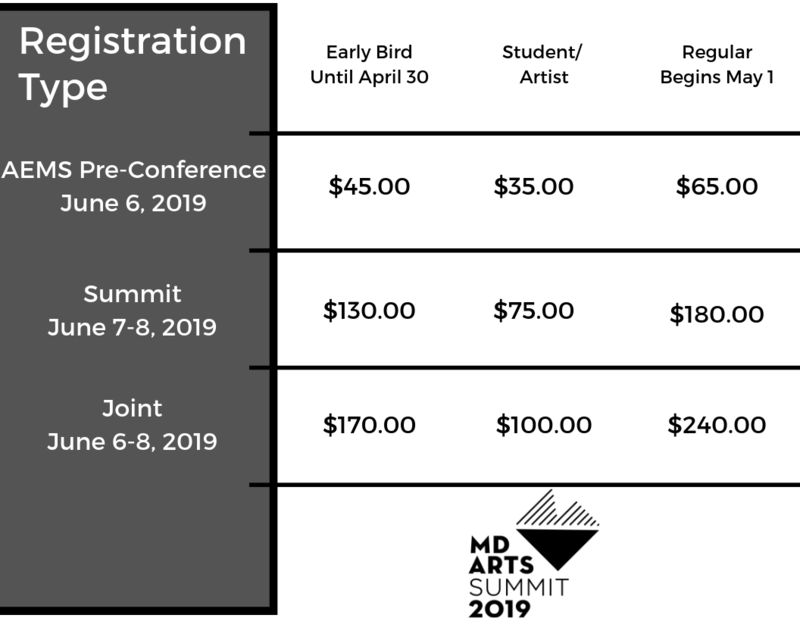 Artists who choose to sell their work at the Summit will be responsible for collecting and processing their own payment. Note: Artists are eligible for either the Artists Bazaar OR the Artist Scholarship. Please, apply for one or the other. The Call for Proposals for 2019 has closed. Thank you to all who submitted a proposal. We are now in the review process. Decision notifications will be sent by Friday, March 15, 2019.